Firegear proudly continues a 15-year history of bringing warmth and ambience to your home and patio. This fine company is committed to making your backyard the oasis you want it to be by staying abreast of all the nuances and changes in the outdoor living arena . The Kalea Bay Fireplace would be a wonderful addition to your outdoor living space. It will allow you to entertain in style while keeping your guests warm on even the coolest days. With its innovative features and contemporary look, this fireplace will take your social gatherings to the next level. All steel is powder coated with Zinc Epoxy Primer, which is engineered to protect from the outdoor elements. This type of powder coating is used in a number of applications, including automotive. Each AnF unit is built to last, having been tested with 700 lbs. without structural failure and backed by a 5 Year Limited Warranty. 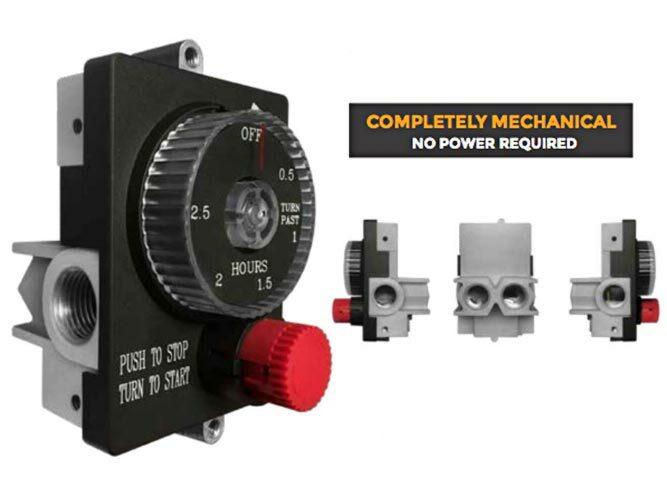 Unique, all mechanical gas shut-off timer with built-in emergency stop - no power required • High Btu capacity • Safest gas timer available in the industry • Available in 2.5 and 1 hour models • Innovative multi-port design provides installation flexibility • 1/2' NPT inlets and outlets (side and back) • Six (6) mounting holes (front and side) for secure installation • Natural gas or Propane - no conversion necessary. Stop by Palmetto Gas and see the beautiful Montego Outdoor Firepit, burning… glowing… bringing warmth and ambiance to your outdoor setting. We’ve placed the firepit in our showroom’s front yard. Come take a look! The TMSI System combines the convenience of variable flame and safety. Lighting the fire is as simple as pushing a button. Once lit, the flame is fully adjustable at the valve knob which features a safety shut-off that turns the gas valve OFF in case of flame loss.